It’s hard to believe I’m "only" up to Prime #5 here. Nostalgia plays a large part in that, I think–part of me is itching to just fly through this series to revisit all the stuff I remember, and see what changes now that I’m a quarter-century older. But I’m hanging back, going through the entire Ultraverse one issue at a time, endeavoring to get the "full context" of stuff (though some of that detail is lost in translation as I’m providing my thoughts and RE-actions to the issues, and not panel by panel summaries/adaptations of the issues). 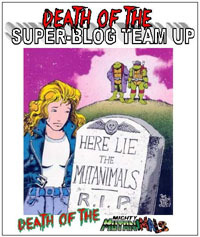 Picking up where the previous issue left off, we find Kevin and Kelly facing a "real life" version of Maxi-Man: a character THEY know as a cartoon, and that we as readers know is one of Boneyard’s demons trying to "prove" itself important and gain Boneyard’s favor. (Boneyard being the main villain in the Mantra title). Kevin strains to re-generate Prime, while Kelly is nearly killed. Once "Primed up," we have several pages of battle between Prime and Maxi-Man, before cutting to Kevin’s father and Colonel Samuels, discussing their past, and Green telling Samuels that Prime is his kid–Kevin! Back to the fight, Prime thinks Maxi-Man is some Ultra-human, until the demon reveals itself (apparently with disdain–it is above humans and Ultrahumans). As the two spar verbally amidst the physicality, Prime lets slip that "No one threatens my girlfriend!" referring to Kelly…which shocks the poor teenager. (Prime’s this huge adult…why would he be interested in a 13-year-old, after all?) Prime realizes that he’s running low on power, and has to put an immediate stop to Maxi-Man’s rampage…so he gathers what remains of his energy and releases it in some sort of energy-burst from his chest, and expends the rest in a quick, brutal beat-down that destroys Maxi-Man (who melts down into a puddle, as the demon disperses, vowing revenge [with a footnote referring us to Mantra #5, coming next month!]) 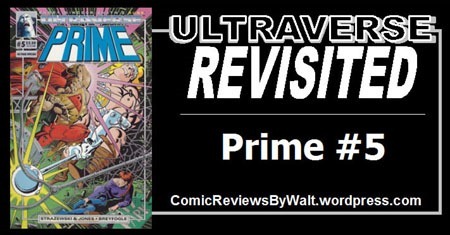 Though Prime is victorious, it’s at a cost–Prime collapses into Kelly’s arms, and she quickly realizes he’s melting! Before anything can be done, Samuels’ men rush in and take the melting hero against the girl’s protestations. As Samuels and his crew rush off, Mr. Green’s left behind lamenting that this wasn’t supposed to happen–and he’s answerless when approached by Kelly as to what’s going to happen. Moving back to Samuels–now in a lab with techs rushing about–the melting Prime-body is stabilized…with no regard for the boy within. When questioned, Samuels declares "I don’t care about the boy! I want the ULTRA!" One of the first things that stands out for me with this issue is Breyfogle‘s art. I love the much thicker lines and less "detail" used for Maxi-Man…giving the character that much more of a "cartoon" look, compared to the usual thinner lines and more realistic style for everyone/everything else. This entire thing is a comic book, it’s all drawings–even the thing that to the drawings (characters) is a drawing. So the different line art makes a big difference, and is pulled off quite well, to me. It’s also interesting to see from the visuals just how similar the two characters are–both are hugely over-muscled brutes–but we get dialogue to realize that Maxi-Man is a character Kevin has "grown up" on, and is clearly one of his "inspirations" for the hyper-muscled Prime body his subconscious generates. Story-wise, we get most of our forward-movement in non-Prime characters. We see some in Kelly realizing this adult hero has a crush on her–considers her his girlfriend–which is a much different thing put to words than her schoolgirl crush on a new super-hero that she’s encountered several times. We see more in Mr. Green interacting with Samuels as we get more perspective on Prime’s "origin," as the result of these genetic experiments by the military…and that while this is Kevin’s story, Prime’s story…in a very real way, there’s a lot to be said of it being Mr. Green’s story, watching his son suffer for his sins a decade and a half earlier. The disembodied/extra-dimensional demon provides a "convenient" means to have some giant brute slug it out with Prime. Most of the issue is a slugfest…but we get the other developments amidst it. It also adds to the interconnectedness of this universe, as the demon ties to Boneyard, who other than this has been strictly a Mantra villain. But because Boneyard exists, this demon is here…but the demon isn’t tunnel-visioned on Mantra, but on his master, and so stirs up trouble with Prime. I feel a bit of a twofold shift in perspective on this series at present: firstly, I’ve more than flipped sides, from being the same age as Kevin–the kid–to being older than even Prime is supposed to be (assuming he’s assumed to be in his 20s). Second, the real-life stuff going on with Gerard Jones. I choose to dissociate Prime and my enjoyment of the title with what he’s pled guilty to, but just seeing things play out on the page–the idea of the adult hero with a crush on a young teenager–is that much more uncomfortable. Yet, as readers, we know darned well that this "adult" in Prime is himself truly a teenager, and so DESPITE the obvious and intended appearances and uncomfortableness built in for added drama…we have a 13-year-old interested in a 13-year-old. This issue’s 3-page segment of Rune shows us the character in the distant past, being presented with an individual as a sacrifice. He feeds on her–showing/confirming to us that he’s a vampire–and see what a difference so many years makes between this and the wasted figure we saw in the first chapter. This also shows us that the younger, more vital Rune was worshipped as a god, which–again–is a far cry from the wasting creature we’d already ‘met’ and leaves us to wonder at all the events between. Visually, this continues to clearly be Barry Windsor-Smith. The creative team is exactly the same on the entire story, so I’ll be repeating that, I’m sure–the consistency is a very welcome "given," as this is essentially "just" 3 more pages of the same issue, serialized across the 11 October Ultraverse titles. Story-wise, this continues to be a slow-burn, or moreso, "drip" as three pages at a time is hardly room for any real story or development as a standalone piece. Presented with different core issues–this one with Prime #5, a distinctly different unit than Sludge #1–there’s "excuse" to be choppy, for 3 page segments to give us different perspectives or glimpses into Rune–what he is/was, what he means, etc. I recall the "complete issue" being rather choppy with such brief scenes…but I’ll likely re-evaluate it as an entire unit when I get to the standalone version of the issue when the ongoing series starts. I was already getting Prime as a series, so this didn’t sell me on Prime; and all the more now 25 years later, Rune is NOT really a standalone selling point for this issue, or the month’s issues. Rune primarily serves as a time capsule or marker of sorts–an easy way to identify the October 1993 titles at a glance, despite dates not being printed on the covers. The Prime portion of the issue feels a little padded-out with the extended fight scene. 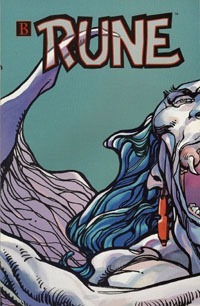 The three story-pages of Rune, plus the recap page and credits/premise page don’t truly stand on their own. But given this is an issue of Prime, the Rune stuff makes for an interesting "bonus." Of course, the proclamation on the Prime cover of this being a 40-page special dampens that–as with Sludge #1–given the 40 pages implies the story, the issue itself, but you really have to add non-story pages to the count to get to 40 pages. That would be more of a problem 25 years ago. Now, in 2018, where these are 25-cent-bin books (maybe 50 cents, but really not $1+, in my eyes! ), it’s a moot point. This is absolutely worth 25 cents or 50 cents just for the Prime portion; and if you’re particularly OCD about filing comics, worth twice that with an extra copy to file with the Rune-side forward. Given there’s a standalone Rune #0 available, and a partial-edition that was packaged with an issue of Spin magazine, I would not recommend seeking this issue out just for the Rune chapter. And as a Prime issue, there’s not MUCH to it to make it stand alone as something unique to seek out…unless you specifically want "the issue with Maxi-Man vs. Prime." Definitely seek this out if you’re putting together a run of the title, obviously. This is best read as part of several issues–ideally the first four and forward. All that said…for 25 cents, if you’re looking for a colorful slugfest between two hyper-muscled figures and a couple pages of a colorful BWS vampire…there’s no real reason to AVOID this issue, as a whimsical one-off!